The London 2012 ‘Digital Games’ just moved into the clouds for the BCC as they are now the first public user of Adobe’s Project Primetime. Project Primetime functions with live and video on demand (VOD) and is the first fully integrated technology platform across connected devices and the Internet, which will be streaming these 2012 Olympics in the UK. Project Primetime provides a single, end-to-end workflow. The amount of Olympic mobile and web content the BBC will transmit and receive over the events 17 days to millions of smartphones, tablets, computers and connected TV’s; will break all previous records and then some, requiring a unified video platform and single publishing technology that will handle the heavy amounts of bandwidth necessary to accomplish this Herculean task. Enter Primetime. 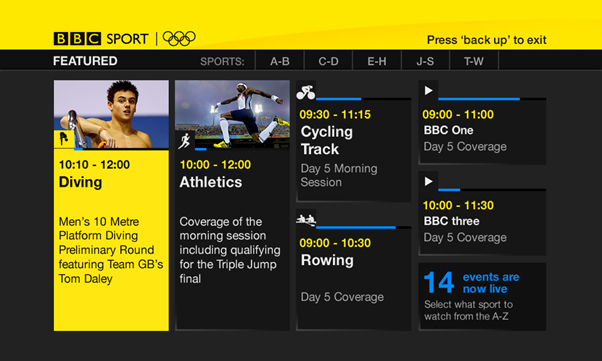 The BBC Olympics and their other sport content will use the proprietary and new, HTML5 app built with Adobe PhoneGap. By instituting an adaptive bitrate video playback technology built with an Open Source Media Framework (OSMF) Adobe can ensure that video re-buffering or stream disruptions are limited as the video leaves the broadcast center and reaches the end users tech. Adobe Media Server prepares the content in using both the HTTP Dynamic Streaming (HDS) format and the HTTP Live Streaming format (HLS). Pre-encoded video streams re-assemble into clips with full adaptive bitrate support. Adobe technology has been completely integrated into the BBC’s data management flow, so the video experience will be supported by synchronized data about the sport and the athlete. There are two core options for Primetime viewing. The first, “Primetime Simulcast” runs on Adobe Media Server technology giving BBC customers coverage of the Olympics and major sports events by simultaneously streaming to desktops, smartphones, tablets, and Internet-connected TVs, including iOS, Android, Mac OS, Windows and SmartTVs. The other key Abobe feature is “Primetime Highlights,” video-on-demand (VOD) single workflow for coverage of key sporting moments. The rendering happens in near real-time and then publishes to approved connected devices. 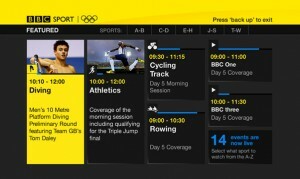 By using an IP connected device the good people of the UK can access the BBC’s Olympics content like never before with Primetime. Do not drink and Primetime, Sports Techie. The BBC will make this so with the magic number of 24. Alix Pryd, director of BBC Distribution, shared the following data. -The BBC will use nine additional satellite transponders giving you all the sport options as possible. Three of these will carry eight SD channels each and the remaining six will carry four HD services each. -You’ll need to make sure your TV is connected to your broadband connection. -The BBC Sport App is also available on the Sony PlayStation 3 and on Virgin Media, Tivo, and a mobile version has recently been launched for Android, iPhone and Blackberry with a shortcup app. -All BBC channels, including the HD ones, are available subscription-free (or in the case of cable, in the basic package). -The Olympics will be on BBC HD. The BBC will offer the Opening and Closing Ceremonies, the Men’s 100m final and a daily evening highlights programme, all in 1920 resolution. From a sports business or sportsbiz perspective, Primetime helps Adobe customers such as the pioneering BBC achieve broadcast audience reach, lower operating costs, and boost revenue from ad sales. From a viewers perspective, your Sports Techie mancave or gadgets just added a Primetime TV-like viewing experience thanks to the BBC and Adobe, just in time for the Olympics Opening Ceremonies in London tomorrow and the official starting time of 8:12 am worldwide. Project Primetime is the industry’s first fully integrated video technology platform to deliver seamless viewing experiences for ad-supported TV content across connected devices. Primetime empowers media companies to publish premium videos, insert ads and measure content across desktops, tablets, smartphones and connected TVs. Addressing the increasing challenges of device and platform fragmentation, Primetime delivers content more efficiently by offering a single, end-to-end workflow that interconnects Adobe’s core video publishing, advertising and analytics technologies. Major components of Primetime include Adobe Auditude(R), the Adobe Digital Marketing Suite, Adobe Access, Adobe Media Server, Adobe Pass and Primetime Highlights. Primetime with full integration of all major components will be available in the second half of 2012 with support for Windows, Mac OS, Apple iOS, Google Android, Samsung SmartTVs and other platforms. Components of Primetime are available today as separate, individual products. Primetime is currently in trial with major broadcasters and media companies around the world. The British Broadcasting Corporation (BBC) is a British public service broadcaster headquartered at Broadcasting House in the City of Westminster, London. This is the dawn of the new ‘Golden Age’ in Sports Technology. These high-tech Games will showcase sports technology to all the new smarphone and tablet users of the world. Athletes, teams, nations, brands, and fans will are part of a movement whose opportunity to shine has come in the form of the 2012 London Olympics. Bravo to the BBC for continuing to push the sports technology envelope during this their third Olympics hosting in the Queens, England. Cheers to Adobe for reaching across the pond with a wiwn-win Solution in the clouds known as Primetime. There has never been a better time to be a UK Sports Techie then right now. Happy Summer Olympics.